Nothing beats a freshly-baked loaf of homemade bread—especially when it’s synthetically autumn. If you’ve never baked one before, let us start by saying that the packaged counterfeits sold in most grocery stores shouldn’t even be called bread. Those unnaturally-soft and tasteless squares are so far-removed from the original concept that they should be named something entirely different. 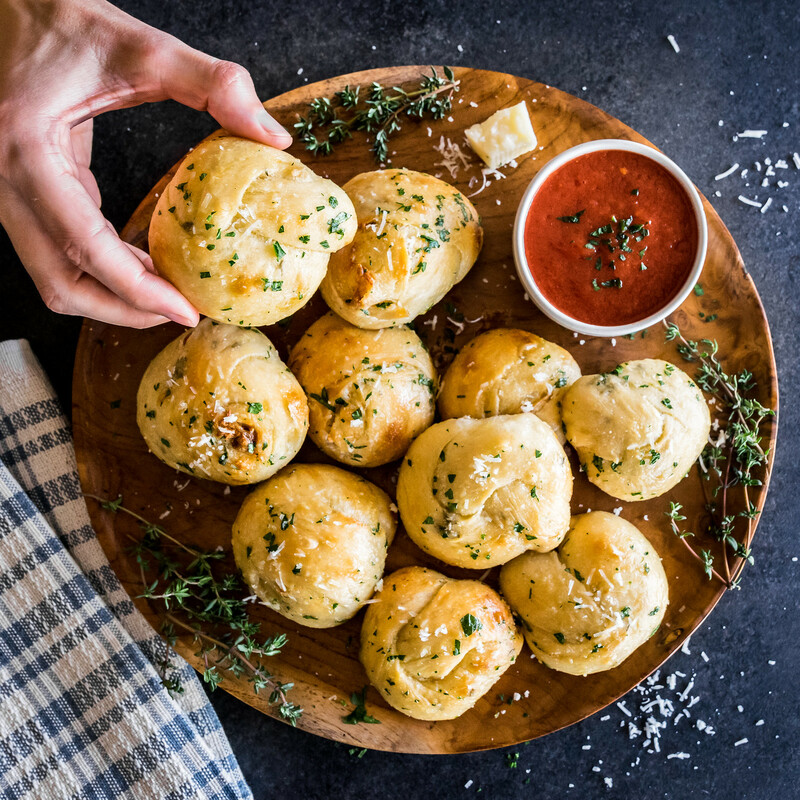 Once you’ve experienced the flavor of homemade, with that exceptionally crusty exterior and the genuinely chewy inside, you’ll know exactly what we are talking about. It’s not difficult to make, and the few extra steps are well worth your time. Those imitations wrapped in bright plastic at the store will soon be a thing of the past. 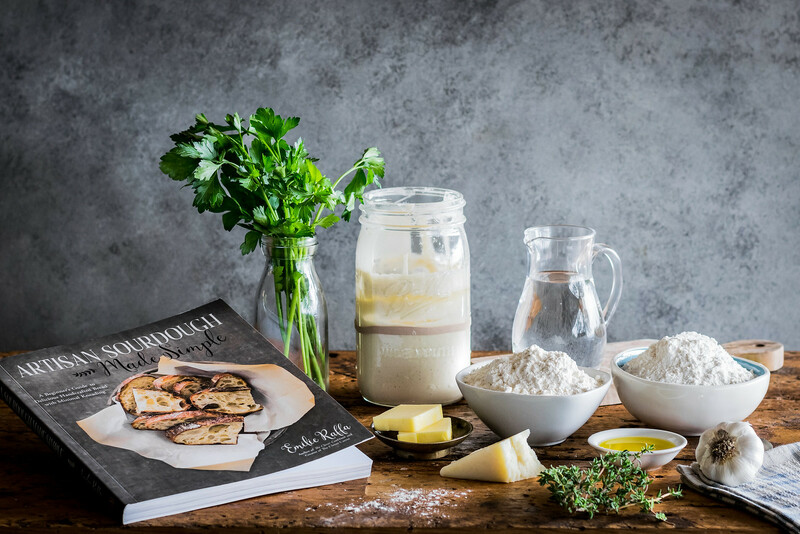 If you’ve been wanting to make homemade bread but weren’t sure where to start, we have the perfect resource for you: our friend Emilie from The Clever Carrot just published her second book, Artisan Sourdough Made Simple! To celebrate the release, Emilie sent us an offspring of her personal sourdough starter called Dillon, named after her oldest son. We followed her detailed instructions, simply fed the dried starter flakes some flour and water, and within a few days, the starter was awake, alive, and we welcomed Cooper—named after the Twin Peaks character—into our family. After baking our very first loaf, we were both completely hooked, which was actually quite surprising since somebody here whose name starts with the letter A has never been the biggest fan of sourdough. But this one was different: only mildly sour, with a comforting bold flavor and a chewy, crusty texture comparable to the best bakery. Beyond just the basics, Emilie’s book is filled with delicious ways you can use sourdough: from chewy rolls and soft sandwich bread, to Sunday morning bagels and cinnamon sugar sourdough waffles, it is complete with scrumptious ideas, easy-to-follow instructions, and beautiful photography, just like her first book. Almost two years ago, we shared her easy zucchini and brown rice gratin here on the blog, and it would fit right in on this year’s Thanksgiving table. 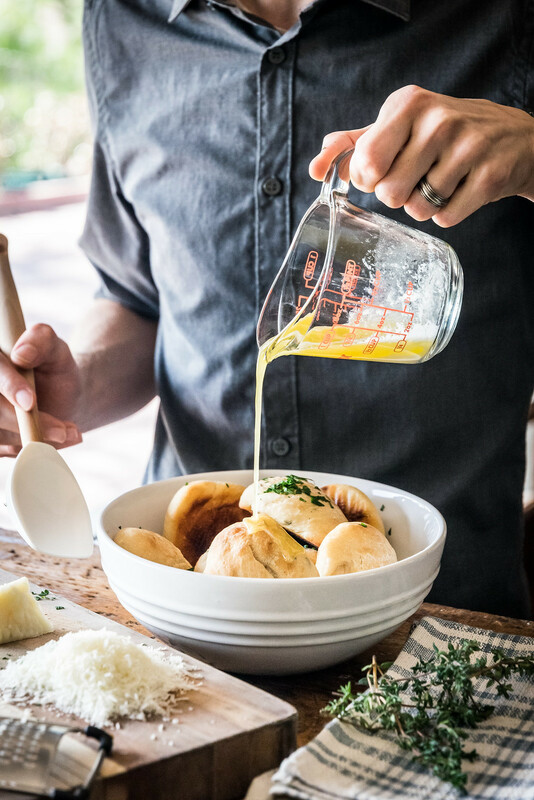 Accompany it with these roasted garlic sourdough knots with pecorino and your guests will be begging to spend every holiday with you for the rest of your life. Of course, if that’s something that you’re not interested in, see paragraph two and purchase a store-bought loaf for $2.99. The recipe we are sharing today is exceptional. 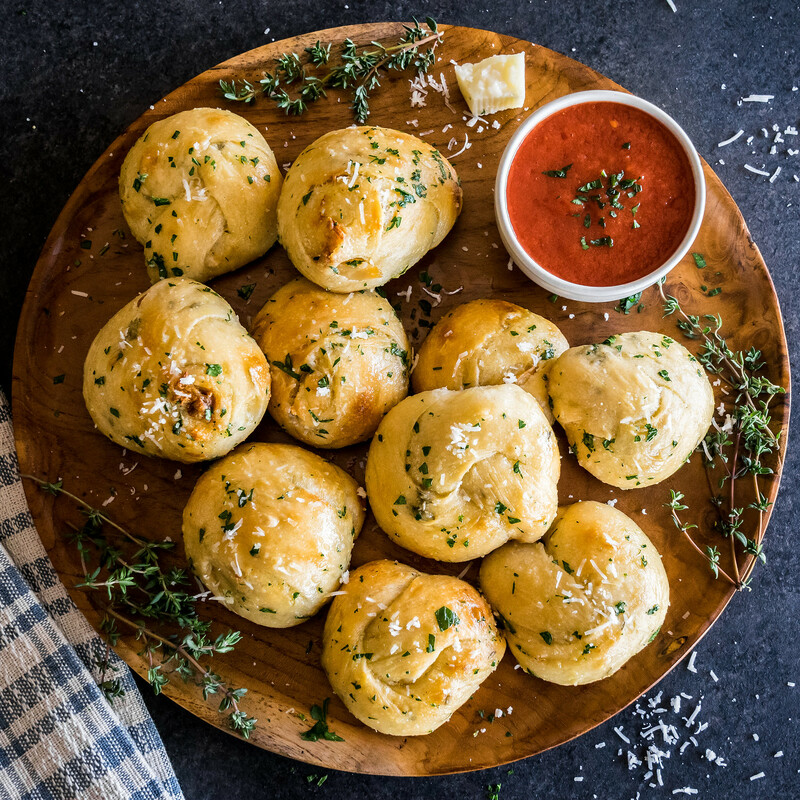 Filled with an entire head of roasted garlic and fresh thyme, brushed with melted butter, chopped parsley, and topped with sharp pecorino, these knots are truly life-changing. Crispy, golden, buttery, and delicious on the outside, with a superlatively soft center, these beauties are ideal for the holidays and the perfect side for your Thanksgiving dinner—or any day of the year for that matter. Hopefully our rain dance will work and Los Angeles will get hip to the season, but in the meantime, we are going to stay in pajamas and robes all day long, put Cooper to good use, and bake every recipe from this book. In the morning, preheat the oven to 400°F/204°C. Cut the top of the garlic head off so the cloves inside are exposed. Place the garlic cut-side-up on a square of foil, then drizzle the olive oil over the top. 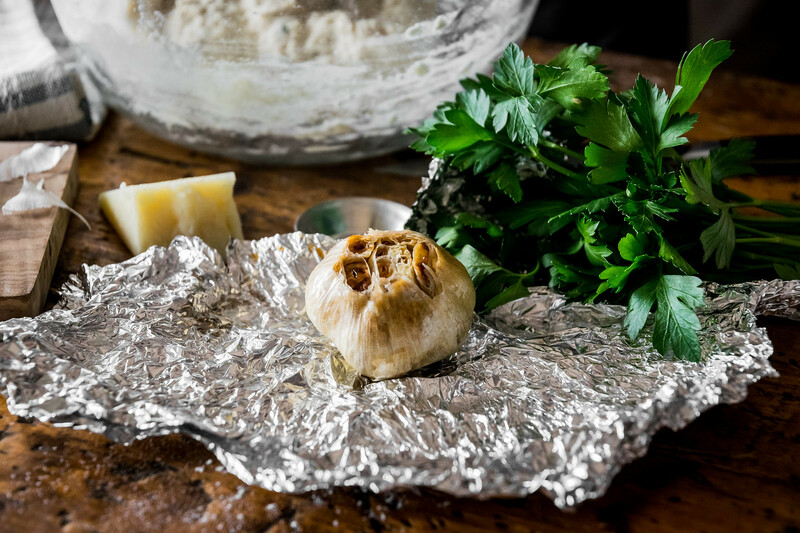 Wrap the foil up and around the garlic, forming a sealed packet. Place directly on the oven rack and roast for 45 to 60 minutes, until the cloves are golden brown and spreadably soft. 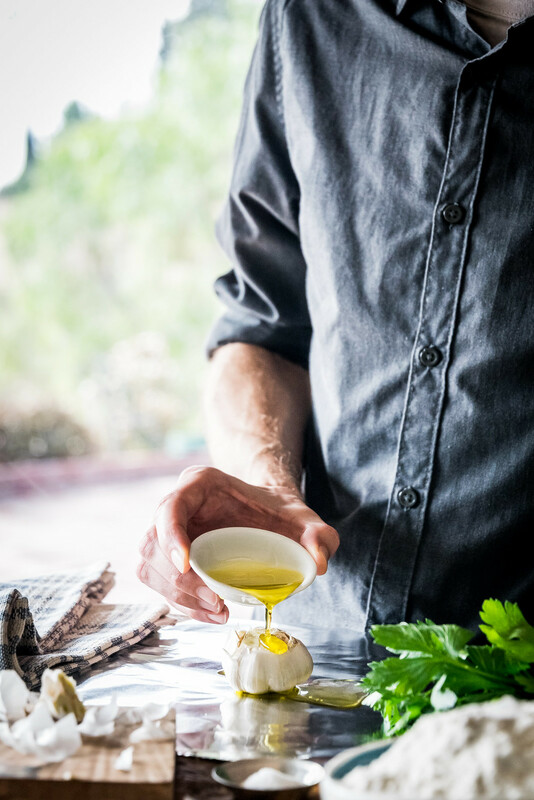 In a medium bowl, whisk together the starter and water with a fork. 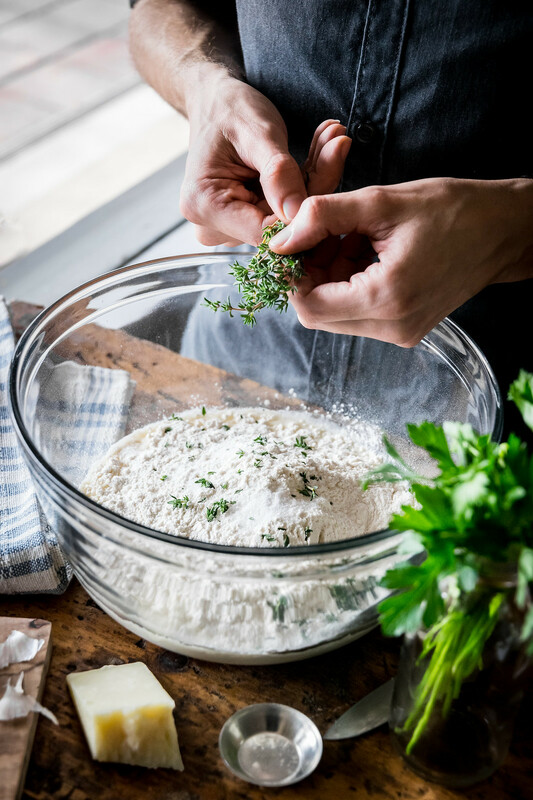 Add the all-purpose flour, bread flour, salt, and thyme leaves, and stir to form a shaggy dough, ensuring you catch the bits of flour on the sides of the bowl. Cover with a damp kitchen towel and let rest at room temperature until the garlic is finished roasting. 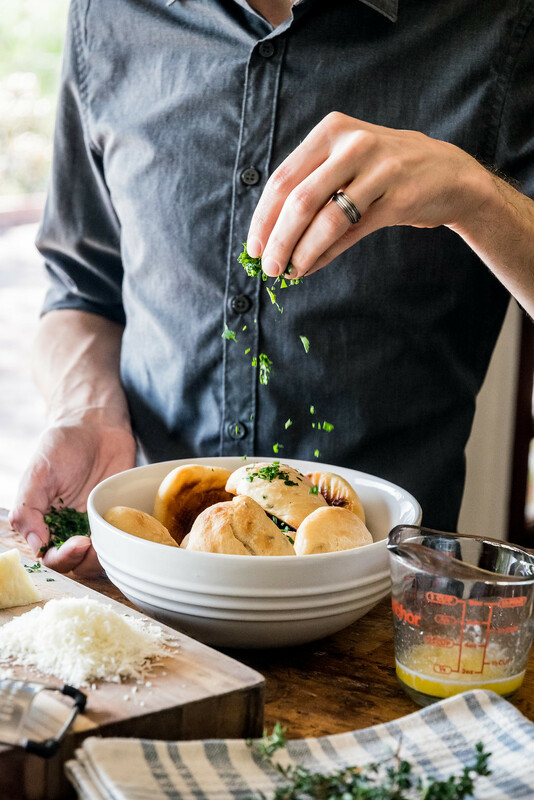 Once the garlic is cool enough to handle comfortably, squeeze the cloves out directly into the bowl, and knead briefly to incorporate the cloves into the dough. Cover the bowl with a damp kitchen towel and let rise at room temperature until doubled in size, about 8 to 10 hours at 70°F/21°C. Once the dough is fully risen, remove the towel, cover the bowl with plastic wrap, and refrigerate overnight. The next day, when ready to bake, line a baking sheet with parchment paper. 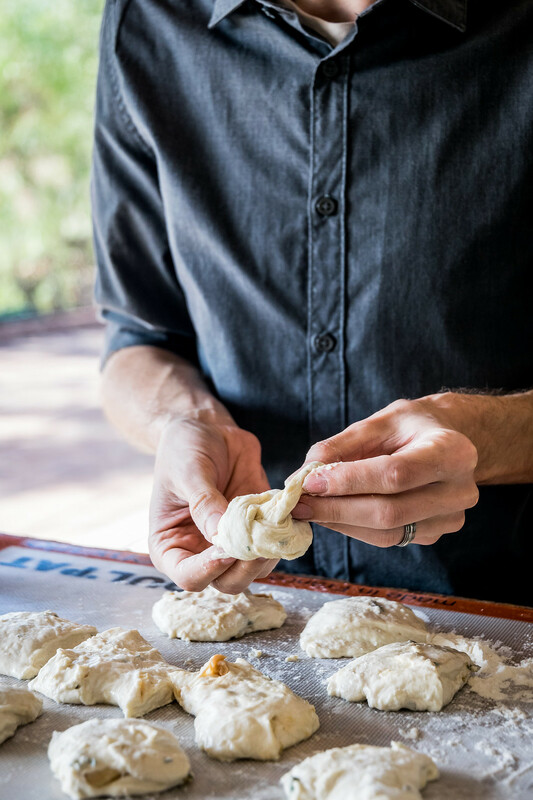 Carefully transfer the cold dough to a lightly-floured work surface and let rest for 10 minutes. 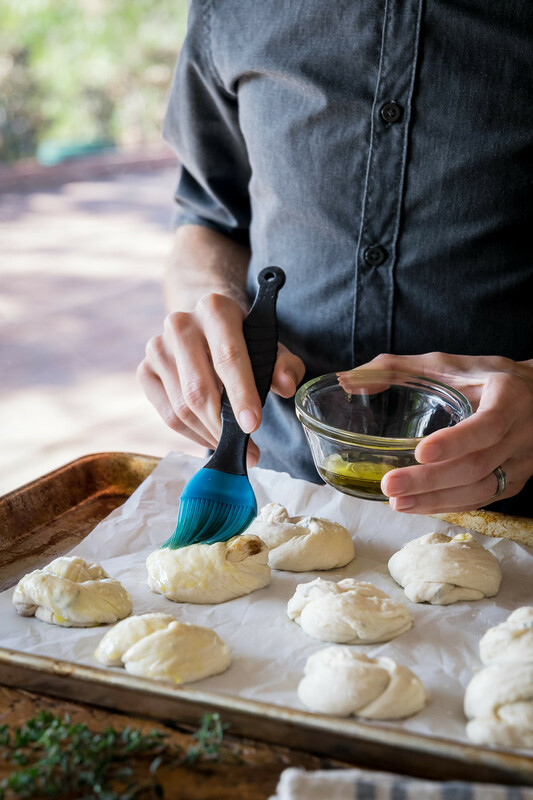 Using a knife or bench scraper, divide the dough into 10 equal strips, each one about 2oz/60g. Hold the ends of one strip, and gently stretch to tie a knot shape. Place on the prepared baking sheet, and repeat with the remaining dough strips. Brush the knots with olive oil. Cover the dough and let rest until puffy, 1 hour or more, depending on the temperature of the room. Meanwhile, preheat the oven to 400°F/204°C. Uncover the knots, place the baking sheet on the center oven rack, and bake until light golden brown, 20 to 25 minutes. When finished, transfer the hot knots to a large bowl. Drizzle over the melted butter, then sprinkle with parsley and grated pecorino to taste. Toss well to coat evenly, then serve warm, and enjoy! — These knots are best the first day they are made, but will keep for several days in a sealed container at room temperature. 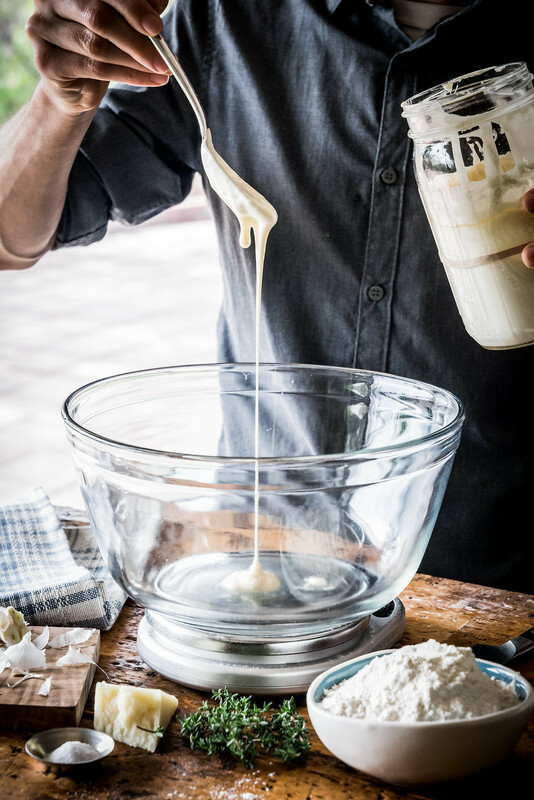 — A sourdough starter is essentially a paste of flour and water that is filled with active live yeast. 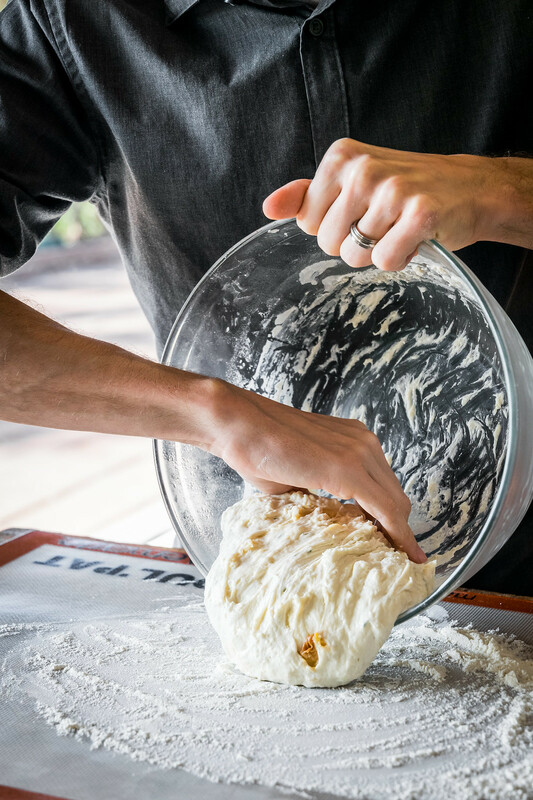 It’s what makes sourdough special, and is responsible for the flavor and texture of the final loaf. You can get a starter in two ways: get a sample from a friend, or make it yourself. The instructions for creating and caring for a starter require more space than we have here, but thankfully Emilie’s book has detailed step-by-step explanations for every part of the process. 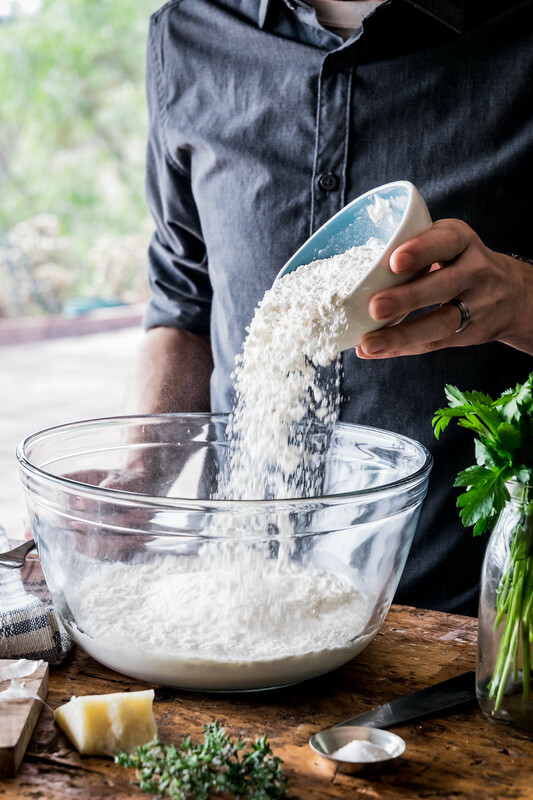 You can also check out the sourdough beginner’s guide on her website, and you can read a basic overview of creating a starter here. — To make this recipe vegan, use a non-dairy butter and omit the pecorino. 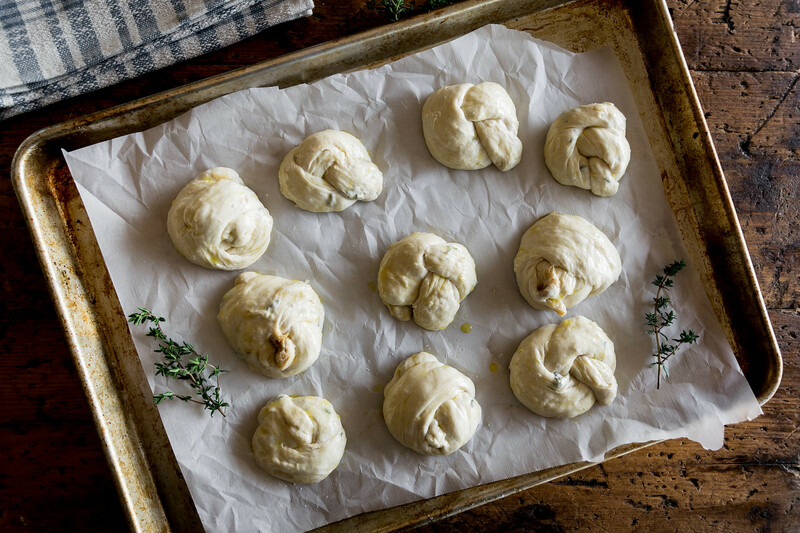 These knots look so delicious, love the pecorino! Yay!! Thank you so much Emilie! We are complete newbies to the world of sourdough, but honestly your book made it SO easy, that our first loaf was literally flawless. And we can’t thank you enough for sending your starter to us! It’s such a cool concept that they can be shared and spread all over the world! We had a friend comment on Facebook that their starter was over 200 years old! Such an amazing tradition, and now we’re a part of it too, thanks to you! These knots look phenomenal. You guys did such a fabulous job. I need to make this asap. Really enjoy your style 🙂 Thank you so very much ! Quick question, do you deflate the dough after the bulk rise of 8-10 hours before covering it with oiled plastic wrap and putting it in the fridge or do you just cover it fully risen and place it in the fridge overnight? I bought her book and love all of the recipes I have tried so far and this is the next one on the list but I wasn’t sure about this particular step. Hi Katie! There’s no need to punch down the dough here, just cover it with plastic and leave it as-is.